Training is vital for the employees of a company and the truth is that most of the employees of small to medium companies do not have growth opportunities because of the lack of a solid training program that is used by the employer. Office worker takes a break from his work and leans back daydreaming. Photo courtesy of Shutterstock. 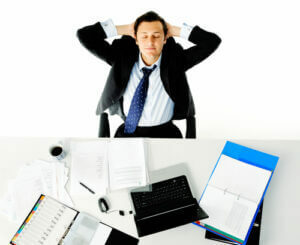 Stress among adults is often linked to work. The problem is they don’t know when they are already stressed. Juliet Schor, writer of the best selling book The Overworked American, tells that people are literally working themselves to death. They get 90 minutes less sleep than they should, resulting to chronic diseases like hypertension, diabetes and depression. Overworking can cause serious problems but modern employees have become workaholics. Dean Schabner of ABC news reports that people work longer days, get less vacation time, and feel pressured with competition resulting to so much stress. Career choice concept. 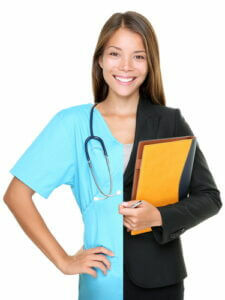 Woman split half and half in businesswoman and medical doctor / nurse. Young smiling woman isolated on white background. Photo courtesy of Shutterstock. Choosing a career that fits your personality is a difficult choice that sometimes can only be completed when you have tried a few on for size. Luckily, you can also take a personality test that should help determine what occupations best fit your style. The most common one is Myers-Briggs. Employers, What Makes Your Employees Happy on their Entry Level Jobs? I believe most employees want to be happy at work, whether they’re on entry level jobs or in other positions. 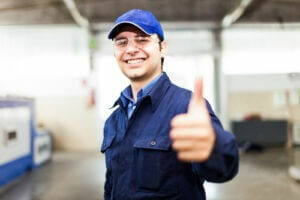 For employers who may not know what can make their workers feel good, find out in the following post. For those of you who have or will search jobs for recent college graduates, make sure you feel good about your positions. The following post features an infographic explaining how happiness leads to career success.